Facebook owned messaging app, WhatsApp, is known for its regular updates to facilitate its users and hence has become the most famous chat app. Recently the company rolled out the new status feature like Snapchat which allows users to put images as status. 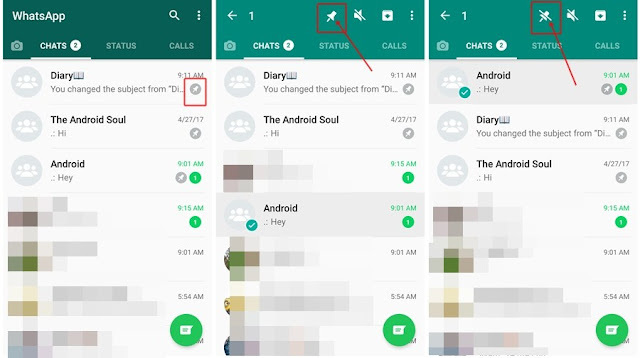 The new WhatsApp update allows users to pin chat with their favorite contacts to the top to the chat tab. This new feature is being tested on Android for now and expected to rolled out to all version of the app soon. The new update is spotted first by Android Police in the latest version of Android beta. If you are running WhatsApp beta for Android version 2.17.162 or 2.17.163 you will be able to notice it. To PIN the individual or group chat, press on the chat you want to pin to the top and choose the Pin symbol from the top bar. You can also unpin WhatsApp chat whenever you want by long pressing the option. As soon as you enable pin a chat, it will remain on the top of your chat list. All the recent WhatsApp chats with other individuals and group will display after these pinned chats. It will really help you to put your loved one or work group on the top of the chat all the time. WhatsApp allows you to pin a maximum number of three chats.